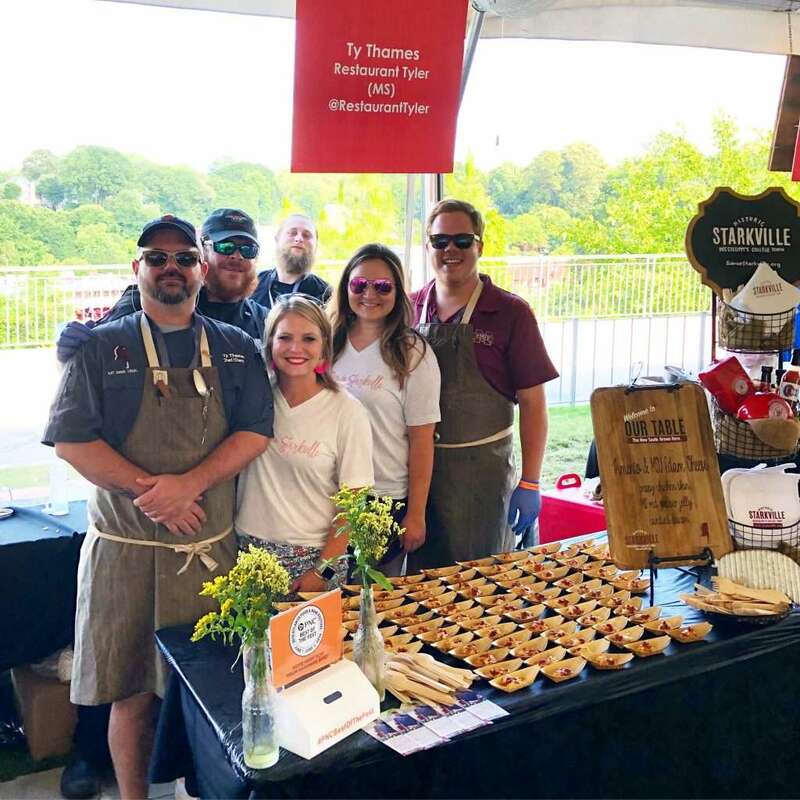 A taste of Starkville’s culinary scene was on display this month at the annual Atlanta Food and Wine Festival on May 31 – June 3, and Starkville was cheesin’ it up showcasing a Southern staple – pimento cheese! 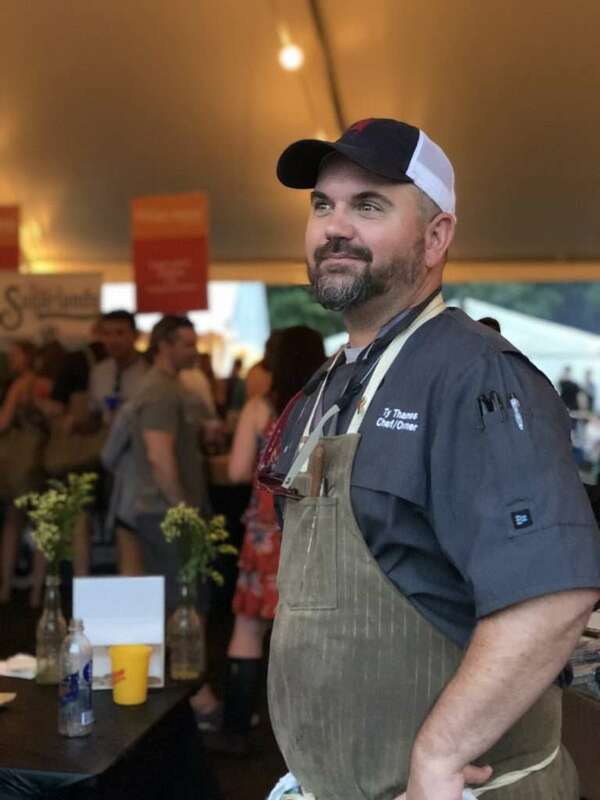 Chef Ty Thames, owner and executive chef of some of Starkville’s most celebrated restaurants, joined the Starkville Convention and Visitors Bureau for several events showcasing the tastes of the New South being created by Starkville restaurateurs. Chef Ty was among a select number of regional chefs selected to participate in Friday’s event, ‘Summer Fridays: House Party.’ In addition, Visit Mississippi invited Starkville to participate in Mississippi’s “Southern Road Trip” tent, part of the much-visited Tasting Tents event in Piedmont Park on each day of the festival. The Summer Fridays: House Party event was an assortment of smoky lunch samples prepared by the next generation of Southern talent who are already making waves in the culinary scene. Hosted by acclaimed chefs and ambassadors for the industry’s next generation, John Currence and Edward Lee, the House Party Lunch kicked-off our Friday program with delicious summer bites, hand-crafted cocktails and other refreshing libations. For the House Party event, Chef Ty served up char-grilled pimento cheese oysters topped off with candied bacon and red pepper jelly. All pimento cheese throughout the weekend was made with Mississippi State University Edam cheese, a dairy specialty from right here in Starkville! 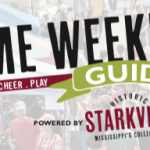 On Friday, Saturday, and Sunday afternoon, Starkville was invited by Visit Mississippi to participate in its sponsored “Southern Road Trip” Tasting Tent. The Tasting Tents are a hugely popular component of AFWF, as culinary enthusiasts from around the country sample the tastes of the South. The Starkville booth saw thousands of visitors from the festival! Starkville’s exhibit space was styled by Partnership staff, and featured a rustic-inspired theme using wood and burlap elements, fresh flowers, MSU Edam Cheese & MS Hot Sauce were on display, and the booth also featured a hand-painted over-sized cutting board. Visitors enjoyed a sampling of Chef Ty’s variations of pimento cheese each day. Deep South and Company, a wholesale and design division of Starkville’s Deep South Pout, provided custom “Starkville” tee shirts to our booth team for Partnership staff to wear. The Starkville Convention and Visitors Bureau extends a special thank you to Visit Mississippi for their sponsorship of the Southern Road Trip tent, and for including Starkville in its showcase. In addition, we were pleased to once again meet Dominique Love, the founder of Atlanta Food and Wine Festival, and share our dish with her as well as the memorable experiences of this outstanding event. In addition to his work at AFWF, Thames continues to successfully represent the Starkville culinary scene. Thames is set to lead off a new Mississippi Monday dinner series beginning June 11! Click here to learn more. Once again, Starkville was proud to be one of the five towns representing the Magnolia State during Atlanta Food & Wine Festival.